Home » Public Transport » Bus » Legit or kabit? Traveling one morning from Antipolo, I spotted a bus with a familiar company name – EMBC. The last time I saw these buses operating as public transport was when I was in college, and I thought that the company folded up after losing money. However, I have seen some of their buses being used as shuttle services. It seems that the company has been revived but how is a bit unclear. EMBC stands for Eastern Metropolitan Bus Corporation, which was an old company that served the towns of Rizal along with the Antipolo Bus Co., G-Liner and CERT buses during the 1970’s and 1980’s. EMBC buses competed with the Antipolo Buses with their routes overlapping between Tikling Junction in Taytay, Rizal and Divisoria via Ortigas Avenue, E. Rodriguez Ave. (C-5), Pasig Blvd., Shaw Blvd., and Aurora Blvd. These two had overlapping routes with G-Liner and CERT, which plied the Taytay/Cainta to Quiapo route via the same Ortigas Ave. Extension. 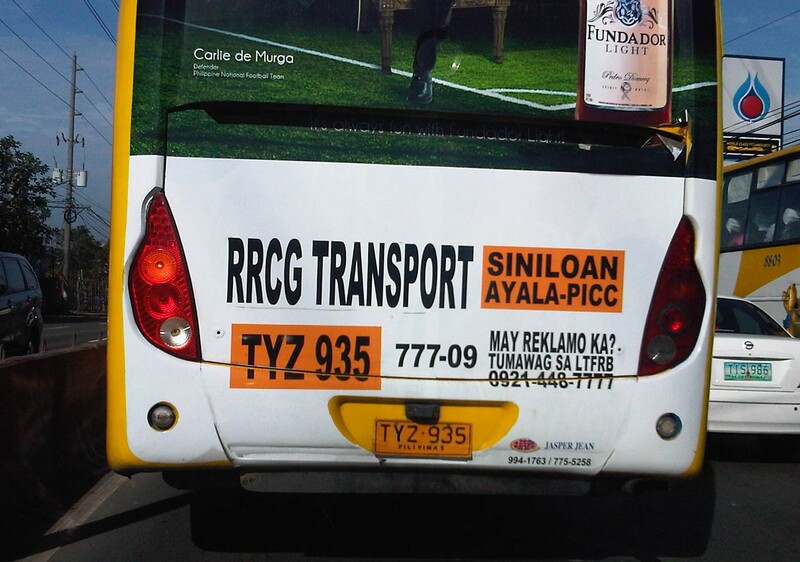 The back of the EMBC bus states that it is run by RRCG Transport with a route connecting Siniloan, Laguna and Ayala Avenue-PICC (it probably turns around at the PICC, where Gil Puyat/Buendia Ave. terminates). Closer inspection reveals that the bus is operated by Jasper Jean, another bus company that is better known for its Fairview-Alabang services. The concept of “kabit” (literally “connect” in English) in public transportation is not a new one. It has been used (and abused) in many cases) where the existing franchise holder(s) along a specific route could not deploy the number of vehicles necessary to address the demand for transport. In such cases, the franchisee (an operator) enlists other entities to provide the vehicles. And so there is an agreement among the formal franchise holder/operator and the “kabit” entities outside the contract between the government and the franchisee. This is one reason why it is not necessarily the main company (franchise holder) that can be the guilty party in an incident involving one bus. However, the penalties (e.g., suspension and fines) are imposed on the franchisee and not necessarily to the “kabit” operators. The latter’s vehicles in turn continue to operate despite the suspension being technically applicable to ALL vehicles bearing the company’s name. Such are among the many issues concerning “kabit” and perhaps also among the strongest arguments to put a stop to this practice that is detrimental to the interests of people taking these buses. By d0ctrine in Bus, Governance, Policy, Public Transport on February 3, 2015 .